Over 1,000 people joined on the streets on November 12, 2016 to stand with Standing Rock, an indigenous community in “North Dakota, USA” that has been fighting to stop an oil pipeline from crossing their territory. The march stopped at several banks that invest in the Dakota Access Pipeline. This is just one of many solidarity actions worldwide to bring attention to the struggle to protect the water and for indigenous sovereignty. Montreal #NoDAPL Solidarity Over 1 thousand people Invaded the streets to stand with Standing Rock, An indigenous community in “North Dakota, USA” That has been fighting to stop an oil pipeline from crossing their territory. The march stopped at several banks that invest in the Dakota Access Pipeline. On September 28th 2016, Climate Justice sponsored another Rap Battle for Climate Justice at Concordia University. With your help, we raised over $800 for ASAP (Aamjiwnaang and Sarnia Against Pipelines). What happens when a Climate Justice emcee takes on a Big Oil lobbyist rhymer? Find out here. Please share and donate to www.line9shutdown.ca if you like this video! Starring Shemar Gordon, Bruce Payne (secretly Jon Lachlan Stewart), and Aamjiwnaang activist Vanessa Gray. Directed by Stefan Verna. Beat by Yeezus, Black Skinhead. If you like what you see, come see this LIVE: Rap Battle for Climate Justice: Wed. Sep 28th. Organized three screenings of Kanehsatake: 270 Years of Resistance, followed by discussions in UQAM, Plateau, and NDG featuring Dan David from Kanesatake. MONTREAL, October 14, 2014 – As TransCanada gears up to apply to National Energy Board (NEB), Climate Justice Montreal releases a communique rooted in a climate justice perspective in opposition to tar sands and the TransCanada Energy East pipeline. With a photo symbolizing the direct action that is already taking place along pipeline routes across North America, Montrealers say that oil companies should expect more popular resistance. TransCanada is expected to submit an application in the very near future to the National Energy Board (NEB) seeking approval for the Energy East pipeline project. This project would convert an existing natural gas pipeline, parts of which are 40+ years old, to a tar sands oil transportation pipeline, and additionally construct new pipeline between Québec and New Brunswick with a port in Cacouna, QC, and a refinery in Saint John, NB. The Energy East pipeline would carry 1.1 million barrels a day of crude tar sands – the dirtiest – oil, which would be the largest tar sands pipeline in the world. With the release of this communique, Climate Justice Montreal (CJM) seeks to highlight not only the infrastructural concerns with this pipeline, but the catastrophic effects of continued tar sands and pipeline expansion on marginalized communities, in particular indigenous people. “We will never be able to stop tar sands expansion until we look at the root causes of the issue – the racism that allows indigenous communities to become ‘sacrifice zones,’ and that displaces communities of color with each global disaster,” said Rushdia Mehreen, a member of CJM. Climate Justice Montreal demands that fossil fuels be left in the ground, and that Energy East not be constructed. “The coming year provides us with plenty of opportunities to stand together, mobilize towards stopping the Energy East pipeline, and generally work to build a better world for all”, said Robin Reid-Fraser, another CJM member. Climate Justice Montreal is a grassroots group pursuing environmental and climate justice in solidarity with directly affected frontline and indigenous communities. Climate Justice Montreal aims to highlight the voices of those least heard and most impacted, and emphasizes an anti-capitalist and anti-colonialist perspectives. 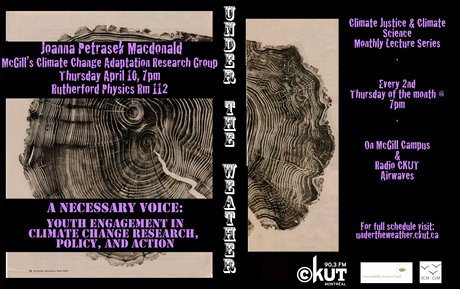 Under The Weather was a 12 month Climate Change Speaker series presented by CKUT and co-sponsored by CJM. Following the forum, three strategy meetings have been held with forum participants, partner organizations, and others concerned about the tar sands coming to Quebec.